Synapsids (meaning 'fused arch') are a now extinct taxonomic subclass of reptiles which possessed many skeletal features also present in modern-day mammals. Features unique to synapsids were only one opening (temporal fenestra) on each side of the skull and front teeth that were different in structure and size from their back teeth. Like all other terrestrial reptiles, the synapsids were created on Day 6 of the Creation Week. In the years following the Flood, the descendants of the various synapsid species taken on board the Ark were known to ancient people as "Dragons". Evolutionists often claim that the synapsids (especially the therapsids) were the ancestors of modern-day mammals due to their possession of mammal-like features. Evolutionists point to animals such as Cynognathus (a small mammal) as being supposedly transitional between reptiles and mammals in an attempt to support this idea. 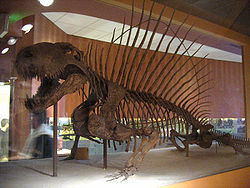 (True) synapsid remains are predominantly found in fossil strata assigned to the 'Permian' by evolutionists, though they believe that the last synapsids went extinct alongside the Dinosaurs during the so-called K-T event. Synapsid anatomy ranged from being essentially reptilian to mostly reptilian with some mammalian features, though all synapsids (possibly bar the theriodonts - see below) were reptiles. Fossil evidence suggests that the Pelycosaurs (and possibly also the therapsids) did not possess epidermal scales on their skin like most other reptiles, though their belly was covered in dermal scutes like those seen in reptiles and some mammals. Pelycosaurs had a sprawling gait, while therapsids possessed legs which were positioned more vertically beneath their bodies, as in mammals. Some Pelycosaurs (like Edaphosaurus and Dimetrodon) possessed a tall sail of skin on their backs, which likely performed a thermoregulatory function. Synapsid denture usually consisted of rows of canines, molars and incisors, a feature also present in many mammals. The amount of canines in the jaw varied between two and three, with the front canine usually being larger then the one behind. In therapsids usually only one large canine was present. Synapsids possessed a secondary palate on the sides of the maxilla, which separated their mouth and nasal cavity in some species. The mandible (or lower jaw) consists of a single tooth-bearing bone in mammals (the dentary), whereas the lower jaw of reptiles consists of a conglomeration of smaller bones. Different synapsids possessed either reptilian or mammal-like (though not completely mammalian) jaws. In terms of the middle ear bones, while mammals possess a malleus, incus and stapes (the "hammer" bone, the "anvil" bone and the "stirrup" bone) the synapsids possessed only a stapes. While the mammalian jaw structure is also set apart from that of reptiles by its dentary-squamosal jaw joint, in which the dentary forms a connection with a depression in the squamosal known as the glenoid cavity, synapsids possessed a jaw joint in which the articular (one of the smaller bones of the lower jaw featured only in reptiles) connected with the quadrate bone (forming the articular-quadrate jaw joint). Synapsids possessed a single temporal fenestra behind each eye orbit, unlike the two temporal fenestra present in Dinosaurs. The therapsids possessed a more mammal-like fenestra then most 'true' synapsids, with a sphenoid bone present to cover the inner cranium as opposed to the jaw muscles as in other synapsids. The above features, whether taken in isolation or together, do not sufficiently support the evolutionary view of the synapsids having been the ancestors to mammals. Rather than being transitional animals the synapsids were fully reptile, and are simply a great example of the wonderful variety God originally built into all living things. The diet of synapsids ranged between herbivorous (such as in Edaphosaurus) and carnivorous, though it was often the latter. Before the Flood, their ecological range was mainly in North America, though synapsid remains have also been discovered in Europe, Russia and South Africa. After the Flood, archaeological evidence (such as the Palestrina Mosaic and clay figurines discovered in Acambaro, Mexico) indicates that they had migrated out from the Ark in Turkey into both America and Africa, existing there possibly up until the 1st Century BC (and later). The time and cause of their final extinction is unknown. While there is clear evidence supporting the identification of synapsids within the suborders Caseasauria, Eupelycosauria, Biarmosuchia, Dinocephalia and Anomodontia as reptiles, anatomical evidence suggests that theriodont animals (aka those within the suborders Gorgonopsia, Therocephalia and Cynodontia) were actually mammals, and thus should only tentatively be considered synapsids by Creationists (if at all). Features unique to the theriodonts which are either not found, or are not fully present in other synapsids are a larger, mammalian dentry, ear bones, fully erect pillar-like rear legs and a mammalian temporal fenestra. Therocephalians, alongside the Cynodonts, also possessed mammalian finger and toe bones and a full palatine bone which is extended toward the throat, as in mammals. Pits in the skulls of some therocephalians also suggest that they had whiskers, and Cynodonts also possessed a bulging, mammalian braincase and a wider cheek bone. Evolutionists often claim that therocephalians and cynodonts may have also been warm-blooded and covered with fur, though there exists little evidence to support this idea and the presence of hair or fur (alongside warm-bloodedness) in any theriodonts does not prove conclusively that they were mammals. 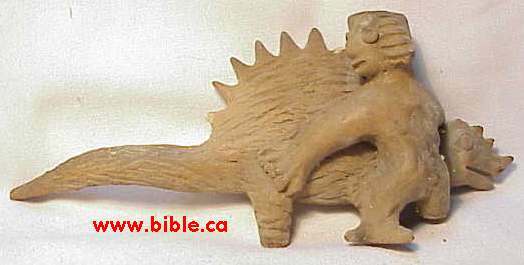 Alongside the clay and stone figurines found in El Toro, Mexico by Waldemar Jalsrud in 1945 was a figure depicting what appears to be a Dimetrodon alongside a Human . 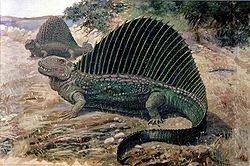 If the figures are genuine (as all evidence suggests), then it would mean that synapsids were present in Mexico around at least 800-200BC when the figures were made , and provides evidence that Dimetrodon was one of the representative animal species bought on board the Ark at the time of the Flood by Noah. The Palestrina (or Nile) Mosaic, a work attributed to Demetrius the Topographer and dated to around 100BC, depicts at least two therapsids in the upper right-hand corner of the artwork alongside a possible third synapsid (possibly Archaeothyris) towards the center. The existance of synapsid animals on the Mosaic indicates that they were seen first-hand by its creator, providing good evidence that synapsids migrated into Africa sometime following the Flood and possibly still existed there during the 1st century BC. A section of the Roman Dionysos Mosaic at Sepphoris depicts what appears to be a theridont animal being hunted or attacked by Humans. The mosaic is dated between the second and third centuries. Sepphoris was destroyed in 363AD following a large earthquake. In the House of the Physician in Pompeii, Rome, there is an artwork which depicts what appears to be two synapsids, one engaging in battle with a Human and the other being ridden or captured by a group of Humans. Pompeii was destroyed by a large volcanic eruption in 79AD. 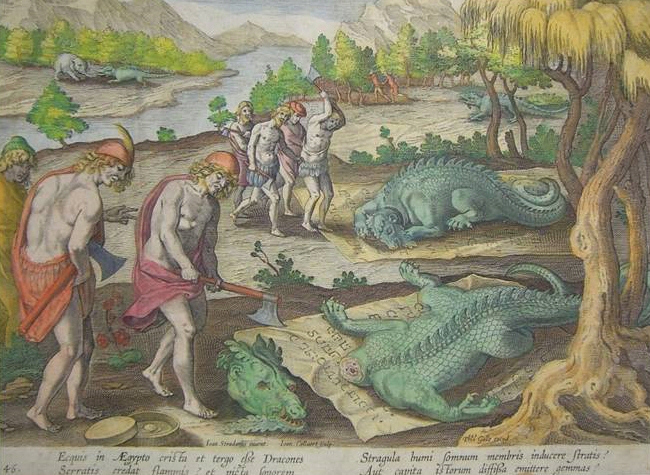 An artwork composed in 1640AD, called Ecquis in Aegypto cris ta et tergo eße Dracones, depicts what appears to be a number of therapsids being killed by Humans. This page was last modified on 26 July 2014, at 11:44.